The Switch Input Board converts up to 64 active-high (+12V) inputs to an 8x8 matrix system. Eight tri-state octal invertors are used to select eight groups of eight switch-data inputs onto a common octal bus as decided by the outputs of a Binary-to-Octal decoder. This has three address inputs and one Board Select input. The address lines define which one of the eight groups of input switch-data is sent to the output buss while the Board Select determines which one of the five SIB-4 boards will be sending this data. The board has pull-down inputs and high-resistance series resistors to protect against static and excessive input voltages. The power system comprises a 5-volt Zener diode as a regulator. Switch inputs on right-angle molex terminals. Inputs 1-64 in 8 groups of 8. Signals 0-12V. +12V = On. Power: 8-15V using on-board regulator. 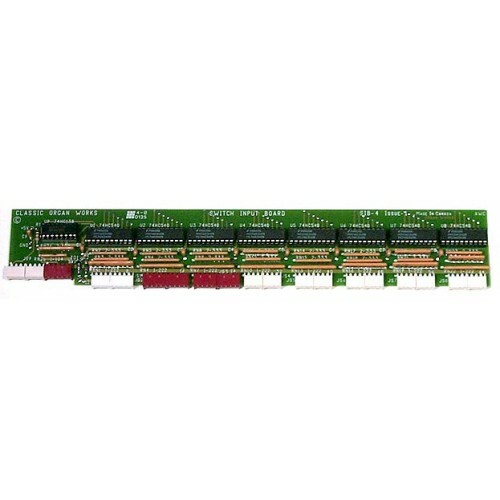 The Control Unit Switch Input Board is normally purchased with control units such as the MCU, CCU, and PCU. Thus, it will be shipped installed within the unit. If it is purchased for upgrade purposes it will be shipped separately.